When it comes to tough timepieces that are also functional while looking great on your wrist, you would not be able to go too wrong when it comes to Casio of Japan. Casio has a long history of rolling out timepieces that are rugged and yet fully capable, and their latest release says it all — the Casio PRO TREK WSD-F20. This is a trailblazer of a watch, where it is powered by Android Wear and is touted to be the ultimate wrist device where tech-savvy outdoor enthusiasts are concerned. The Casio PRO TREK WSD-F20 was first unveiled earlier this year, but the global launch has finally happened. Better late than never, we guess. Powered by Android Wear 2.0, it is perfect when it comes to outdoor activity, thanks to the inclusion of GPS navigation capability in addition to a full color map display, offline map usage functionality, water resistance of up to 50 meters, as well as having been tested to military standard specifications in order to make sure that it is more than capable of withstanding a range of rugged activities and adventures. What kind of hardware will the new WSD-F20 arrive with? For starters, there is the built-in, low-power GPS and full color map functionality that works great even without an Internet connection. Not only that, it will work great in areas that do not have any kind of cellular service, which will then free users up to be able to fully enjoy their adventures. The timepiece itself will be enhanced via richly-designed and easy-to-read map data from Mapbox, and all maps can be downloaded beforehand to the WSD-F20 before you embark on the next great adventure. There is also the brand new Location Memory app which instantly reads the user’s existing location, and will be directly accessed simply by pressing a button that is located on the side. You need not fret about getting lost since you can perform a recording of the path traveled, letting you make a mark or utilize speech recognition when it comes to adding notes in unmarked map spots. To add more value, Casio’s Moment Setter app will alert the user to important moments when hiking, cycling, fishing, or even enjoying a spot of snow or paddle sports. All that the user needs to do is to set conditions to automatically receive important alerts, including the best possible fishing times, a rest break interval, as well as sunrise/sunset times. 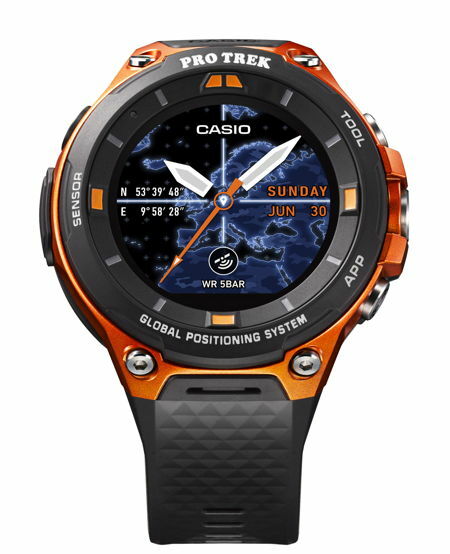 Available in black and orange with an asking price of $500.00 a pop, the Casio PRO TREK Smart Outdoor Watch WSD-F20 is certainly worth checking out if you want a timepiece that can handle just about any adventure you go through.